Bamboo flooring for kitchens is currently a very hot trend for kitchen floors. Bamboo is a very versatile material that is actually harder and stronger than many types of wood. Bamboo comes in tiles or planks in a variety of sizes, colors, patterns, and textures. Bamboo flooring for kitchens also stands up well to food spills and heavy foot traffic. Bamboo floors are also very comfortable to stand on, which is great for the cook and guests alike. As with hardwood, bamboo floors are available in solid or engineered styles. What Is It? Bamboo is actually a grass that grows very rapidly in its natural environment. Some bamboos are larger than many trees and some of these are the varieties that furnish most of the bamboo flooring available today. 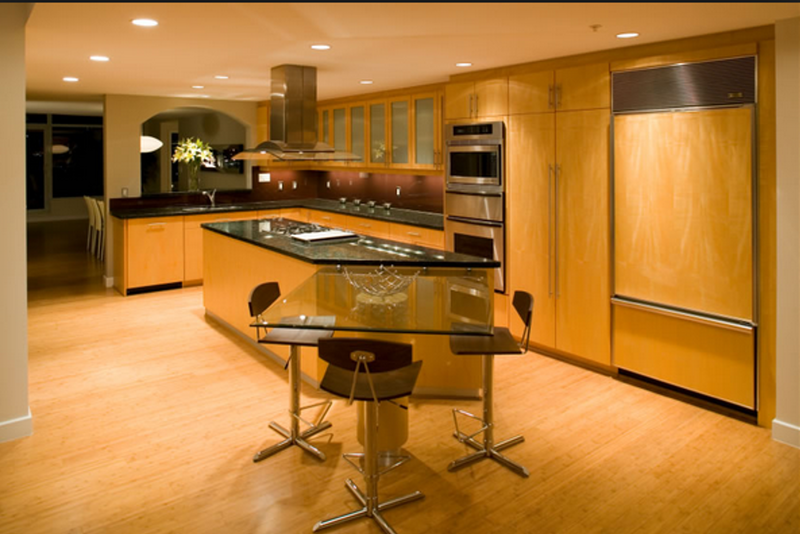 Durability: Bamboo flooring for kitchens are long lasting and durable, but they can scratch and dent. As with wood floors, pet’s claws can scratch bamboo floors. Cleaning and Maintenance: Be sure to clean up food and drink spills immediately. Vacuum and sweep regularly, and occasionally wipe the surface with a damp mop or cloth. Underlayment. The subfloor must be perfectly smooth, as bamboo will show imperfections. Because bamboo is susceptible to moisture, a waterproof underlayment is vital if it is being installed over a concrete slab. Bamboo comes in a range of construction styles. Vertical construction features strips turned sideways for a modern and clean look. Horizontal construction features strips laid flat to showcases the bamboo’s natural jointed ridges to highly the beautiful grain. Woven or stranded construction. bamboo, the hardest type available, is made from shredded strands of bamboo compressed with resin. This type of surface is exotic and beautiful. Stained bamboo comes in a variety of colors; stains can be translucent or opaque. Caramelized bamboo is pressure-heated to brown the sugar compounds. This produces a warm color without using stains or dyes. 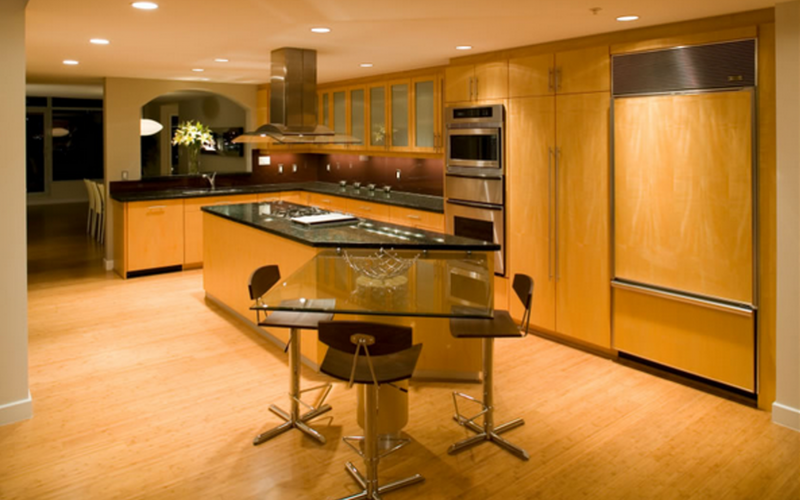 Bamboo flooring for kitchens is the perfect choice for environmentally conscious homeowners. Bamboo plants mature in around six years versus 60 years for many hardwood trees. As a result, bamboo is considered a renewable resource and is very environmentally friendly.